Elissa and I are running a couple of sound and art workshops this summer at Geelong Gallery. We're going to have a lot of fun making beautiful art that looks like percussive sound! Yes, you read that right. We're going to make art that looks like sound. Elissa has a bag of interesting instruments that she is going to play while we create drawings, paintings and collages. It's going to be noisy, colourful fun. I'll even see if Elissa will let us play some instruments too. Go to Geelong Gallery for more information and to book your spot! Listen to the radio piece that Elissa and I made with the help of some very talented storytellers for Radio National's Soundproof! Back in the April school holidays Elissa and I invited some fabulous children to come and tell their stories that were inspired by the music of Between Footsteps and the sculptures at Heide Museum of Modern Art. From all that magic we've created a chorus of found sound, voices and music. and site specific performance art! ...until we could dance no more. I don't know about you, but every time I hear the Running Man track I can't help but leap off the side of the hill and run down to the cows at the bottom of Heide's back paddock. And it seems I'm not the only one! And then there are those of you who are even more talented who come up with wonderful poses and movements inspired by the sculpture and the music. "I have an idea for another kids activity. Kids could make their own wooden stick sculptures. Dad and I are going to do one in the garage!" Thanks Tess, we're going to try that one! The Between Footsteps music has been filling the air at Heide's sculpture park for the last three weeks. And now it is playing in your homes, your cars, your workplaces, your playgroups and your train rides, because we've been on the radio! Have a listen to Radio National talking about Between Footsteps. Our music starts around three minutes into the show. The MUSIC is up on the website ready for you to download. We're putting the finishing touches to our ACTIVITY SHEET that will be ready by Tuesday 12th January. 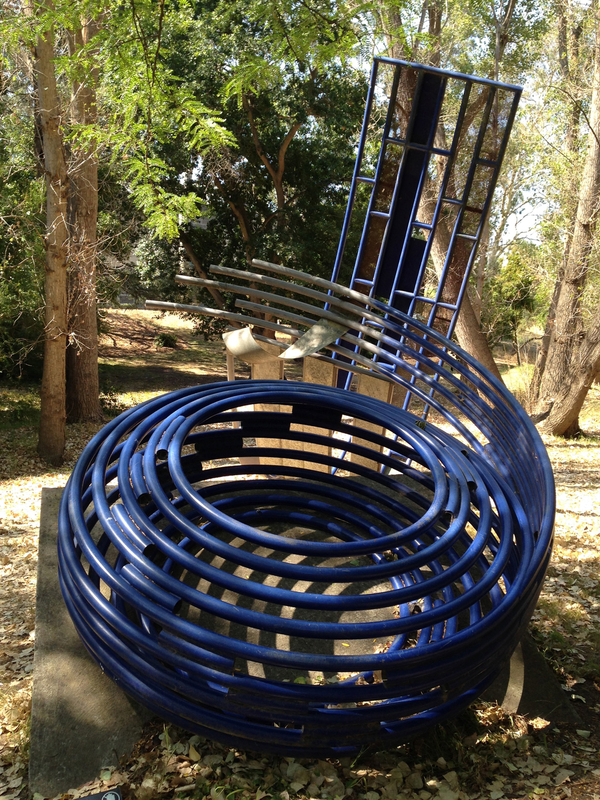 We hope that you can come to listen and play to the music down at Heide's sculpture park. You can come anytime you like until the end of the month. Don't forget to share your stories with us, we'd love to hear what you dream up! Elissa and Adam have been working all day at the computer with open ears and busy brains making the music sound great and ready to play for you. They are mastering the music which is the final step to create a track that you can listen to on your computer, iPod, or CD player. This is Adam. He looks happy. Which means that Elissa is happy. Which means that I am happy because they are creating something that will make you happy! Only a few more days until we can share the music with you. The music and activity sheets will be ready to download on Tuesday 12th January. Then come down to Heide Museum of Modern Art and play with Between Footsteps between opening hours, 10am - 5pm. And then tell us what stories you created! Elissa revealed to me what she and the musicians, Daniel and Elliott, have been recording and mixing. One track is like an explosion of sound that makes it hard to sit still. One track is like walking along the beach. One track is like a quiet little dance. One track is like standing under a night sky of shooting stars. One track is like tumbling around inside a climbing frame and the other track is like floating away into deep, dark space. The next step is to continue to mix the music - that's like putting all the best recorded bits together in the order that we want so that it creates one beautiful track. Then Elissa will master the tracks. That's like cleaning up all the different layers of sound to make sure all the audio is high quality and the track is in a format that can be played on anyone's machine. Then the tracks will be ready to be uploaded to the website for you to listen to and download from January 12th. We're looking forward to hearing about what you can hear in the tracks. I've been working with the lovely people in the Public Programs Department, Beck and Julia, at Heide Museum of Modern Art to create an activity sheet to help you get started on your musical adventure in Heide's sculpture park. Don't worry, the scratching out and scribblings just mean that our brains have lots of great ideas that we want to share with you. For example, one of the activities asks you to dance a sculpture! Our Composer and Percussionist Elissa, and her amazing musicians, Guitarist Elliott Folvig and Drummer Daniel Farrugia might be missing out on some sunny Summer days this week, but they're creating magical music in the ABC studios instead. We'll have these tracks ready to share with you on January 12, 2016. In the meantime we have some photos to share with you. You can see the concentration on everyone's faces - I can tell this is going to sound fabulous! Caught on film, making a film! Elissa got her revenge on me and caught me taking footage for our short film! I felt it was only fair to share it with you. Plus, I want you to make your own films in January at Heide when you explore the sculpture park with our Between Footsteps music. And when you finish your brilliant movies you can email them to us (cressida-at-explosure.com.au) and we'll share them on our website. Our composer, Elissa Goodrich, took us on a tour of Heide Museum's sculpture park to show us how she's been inspired by six of Heide's sculptures. And we made a little film of it. The music that I used is a drumming track that Elissa had written for another project, but I thought it suited the energetic, exciting day that we had exploring the park. Plus our Between Footsteps Drummer, Daniel Farrugia, features in this track, so it matched perfectly. We can't wait to hear what she's created for this project! Our composer, Elissa Goodrich, took us on a tour of Heide's sculpture park to show us the sculptures that have inspired her music making. She also showed us how she used the sculptures to make music! We made sure that Heide gave us permission first, before we used the artwork as percussive instruments. Check out the short film that I made from that day. Elissa also told us about her adventures recording outside in the sculpture part at Heide, Museum of Modern Art. In the sunny, quiet afternoon she came across waddling ducks, sporty joggers, a friendly green lizard! Our six chosen Heide Sculptures! 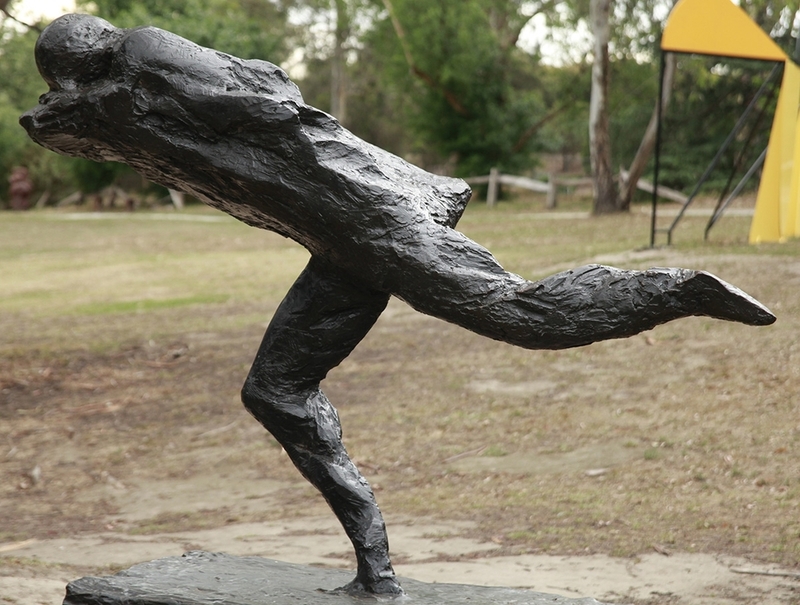 We've chosen six sculptures to inspire six musical tracks from Heide's sculpture park.